I love this time of year but, apparently this year, my allergies do not! I haven't been outside as much as I want because the pollen count is prohibitive -- darn! Cooler weather (but not cold) is always a welcome relief from the 110 in the shade of late summer in North Central Texas. I love pumpkins and fall leaves and decorate my house with them every fall. Very cheery! My husband and I hosted a combined family birthday bash at our home that was well-received and much enjoyed by all who attended. Here's hoping that you and your family enjoy and cherish your relationships. 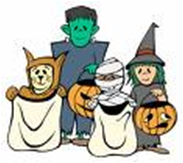 Don't forget to check out the pages and articles (links in this newsletter) for the History of Halloween, Halloween Safety Tips and What to Do With Leftover Candy. If the tips on www.straighten-up-now.com are more than you can handle on your own and you feel you need to hire a professional to assist you, these tips from NAPO (National Association of Professional Organizers) will help. What type of services are you looking for? Some professional organizers offer a wide range of services; others have a specialized niche -- corporate, residential, ADD/ADHD, custom filing, senior help, etc. Where should I begin my search for a professional organizer? There are many places to begin your search. There are many directories for you locate a professional organizer in your area. The Directory on www.straighten-up-now.com is a good place to begin. NAPO also has a directory of professional organizers. What fees should I expect to pay? As with all other professions, fees vary widely based on experience, geographic location, competition, specialty, etc. Some charge by the hour while others prefer a value-based pricing profile and charge by the project. Others will offer various other options. You will need to establish a budget and decide what is best for you. Don’t make a decision based solely on “price” – focus on value and finding someone with a skill set that matches your needs. What questions should I ask? Find out if they are a member of NAPO. While NAPO membership doesn’t guarantee the quality of work, it does demonstrate a commitment to education and industry code of ethics. There are also other professional organization organizers such as POC (Canada), NSGCD (National Study Group on Chronic Disorganization) and AAPO (Australiasian). Your relationship with your professional organizer is personal. They should ask a lot of questions about you, the issues you have, what you may have attempted to become more organized in the past, etc. They should take time to get to know you and your wants, needs, desires and budget. a. What kinds of organizing projects do you do? b. Who is your typical/usual client? c.	What services to you specialize in? d.	Do you have an training or hold any certification in organizing related to specific areas (chronic disorganization, coaching, interior design, etc.)? e.	Can you describe your organizing process/approach and a typical working session? f.	How long have you been in the organizing business? g.	Will I work directly with you or will you assign an employee and/or subcontractor? h.	What is your fee structure? i. Do you work with a written contract? j. What is your cancellation policy? k.	Can you provide references? l.	I have tried to become organized before. How will this be different? Keep in mind that your choice of a professional organizer is not irreversible. A good professional organizer should be non-judgmental, encouraging and supportive, good listeners, good problem solvers and recommend/offer a variety of suggestions/alternatives for your particular situation. Always be sure to let him or her know exactly (but politely) how you feel about the relationship and the work being performed. I hope you enjoyed the October 2010 issue of Messy Makeover Magazine. I consider it a privilege that you took your valuable time to subscribe and read this magazine. Return to top of October 2010 Issue Hi, this is Shelly Morton..the author of this newsletter. I know you hear a lot about how to build an online business, but nothing compares to what you will see when you click the box below. Simply the best way to break the 9-5 routine!